1 2010/03/19 Japanese gam.. Today is the release date ..
2 2009/12/17 Japanese gam.. Today is the release date ..
3 2009/11/27 Japanese gam.. New PV for Final Fantasy X..
4 2009/11/15 Japanese gam.. The release date of Final ..
5 2009/09/29 Japanese gam.. Final Fantasy XIII TGS 200..
6 2009/09/25 Japanese gam.. Final Fantasy XIII got ava..
7 2009/09/08 Japanese gam.. Release date of Final Fant..
8 2009/06/26 Japanese gam.. The release date of Pokemo..
9 2009/06/26 Japanese gam.. Romancing Saga 4 may be re..
10 2009/06/20 Japanese gam.. The averter system of Drag..
2010/03/19 "Japanese game > Today is the release date of "Cross days" which is the succeeding game of "School days""
Today is the release date of "Cross days" which is the succeeding game of "School days". School days got quite much attention when the anime version was on air as not an adult version. And today, "Cross days" was released. But its content is also quite amazing. Well, the game itself is for the age 18+. The below blog doesn't contain any picture only for the age 18+ but please see it by your own responsibility. 2009/12/17 "Japanese game > Today is the release date of Final Fantasy XIII"
I bought PS3 only for Final Fantasy XIII. I am looking forward to playing the game. I will start to play after my partner goes to the bed. 2009/11/27 "Japanese game > New PV for Final Fantasy XIII"
New PV for Final Fantasy XIII. 2009/11/15 "Japanese game > The release date of Final Fantasy XIII outside Japan was decided"
The release date of Final Fantasy XIII outside Japan was decided. It will be released on 9/March/2010 on PS3 and Xbox360. Maybe I will write how to play the game based on Japanese version early. 2009/09/29 "Japanese game > Final Fantasy XIII TGS 2009 Official Trailer"
I will surely play Final Fantasy XIII!!! 2009/09/25 "Japanese game > Final Fantasy XIII got available on Game archives"
Final Fantasy XIII got available on Game archive from 24/Sep/2009 in Japan, which means we can play FF8 on PSP. I played FF7 and FF tactics on PSP. I am very delighted with this new FF on game archives. 2009/09/08 No.2 "Japanese game > Release date of Final Fantasy XIII was announced officially"
It was announced that Final Fantasy XIII will be released in Japan on 17/Dec/2009. And the title was added to this db, too. I haven't played Dragon Warrior IX but I will surely play FF XIII. 2009/06/26 No.3 "Japanese game > The release date of Pokemon Heart Gold / Soul Silver was announced"
The release date of Pokemon Heart Gold / Soul Silver was announced. It will be released on 12th of September in Japan for Nitendo DS. 2009/06/26 No.2 "Japanese game > Romancing Saga 4 may be released / Modified: It was mis assumption"
Romancing Saga 4 may be released by Square Enix. Square Enix made a site for some game which has the number 4. Considering the number, there is big possibility that Romancing Saga 4 will be released in near future. 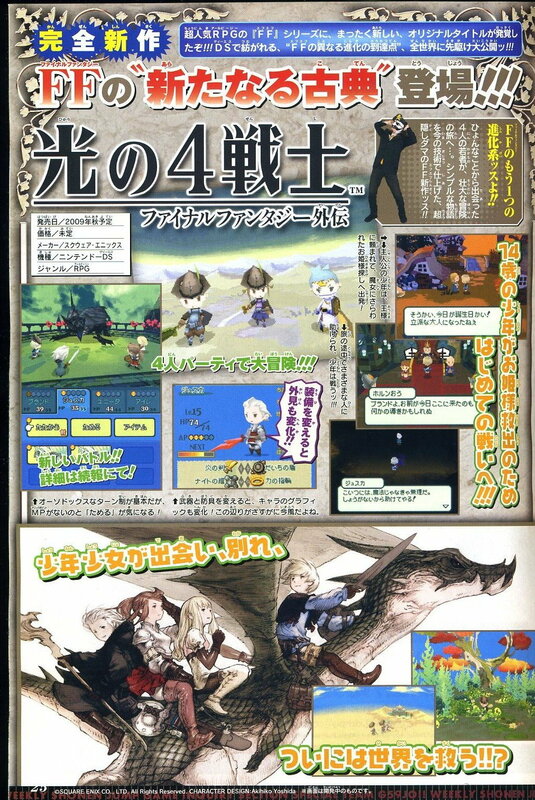 It was revealed that 4 means not numbering of the game but "4 light warrior" of new Final Fantasy for DS (Final Fantasy Gaiden / Final Fantasy: Side story). Most of Japanese people got angry with this fact. I think Square doesn't have to do for this kind of thing just for Nintendo DS's not numbering FF. The fact was revealed by the magazine. 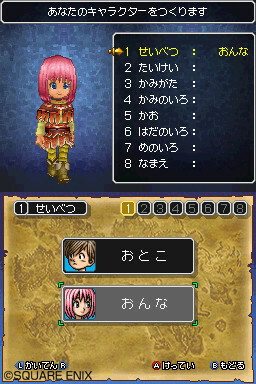 2009/06/20 "Japanese game > The averter system of Dragon Quest IX (Dragon Warrior IX)"
The averter system of DQ IX was instroduced in Famitsu. I won't play it for the first time in the case of the numbered DQ, but it will be sold well in Japan.